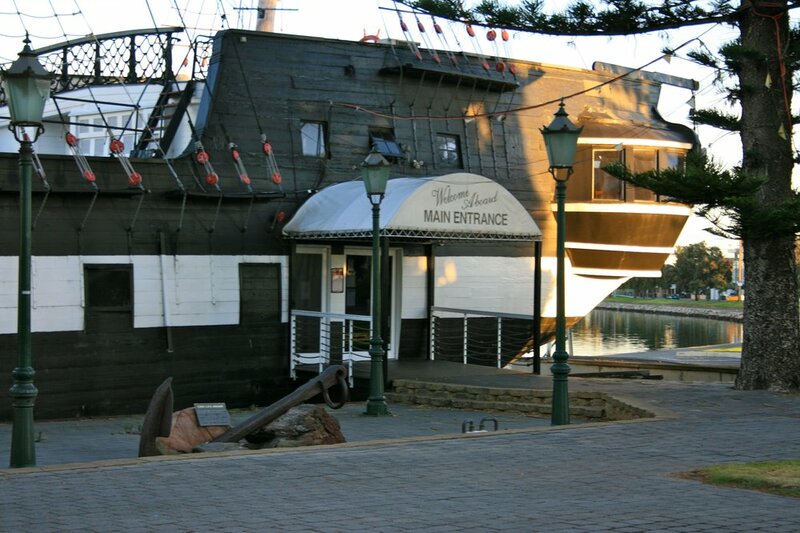 There was a replica of the HMS Buffalo built in South Australia, in the beachside suburb of Glenelg, that for many years was a land based restaurant on the waters edge. 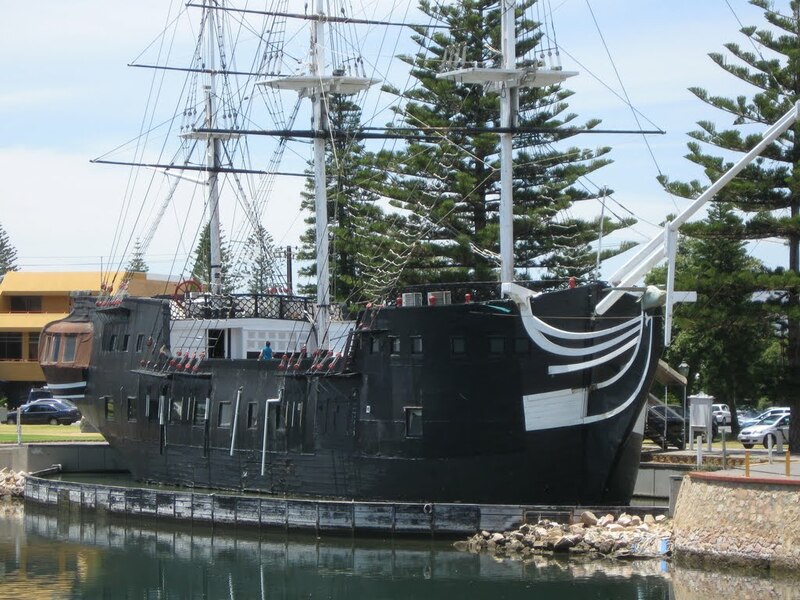 The HMS Buffalo in Adelaide was a replica of the original ship that sailed to South Australia in 1836. Guests would eat down below and after lunch or dinner they could explore the ship and pay a visit to the museum that was located on the upper deck. Mr Finlayson, who ran the restaurant from 2001-06, was forced to take the helm of the Buffalo in 2012 as he was guarantor for the most recent owners, who fell $83,000 behind in rent payments to Holdfast Bay Council. He inherited the business from his father, who spent nearly $1 million to build the vessel. 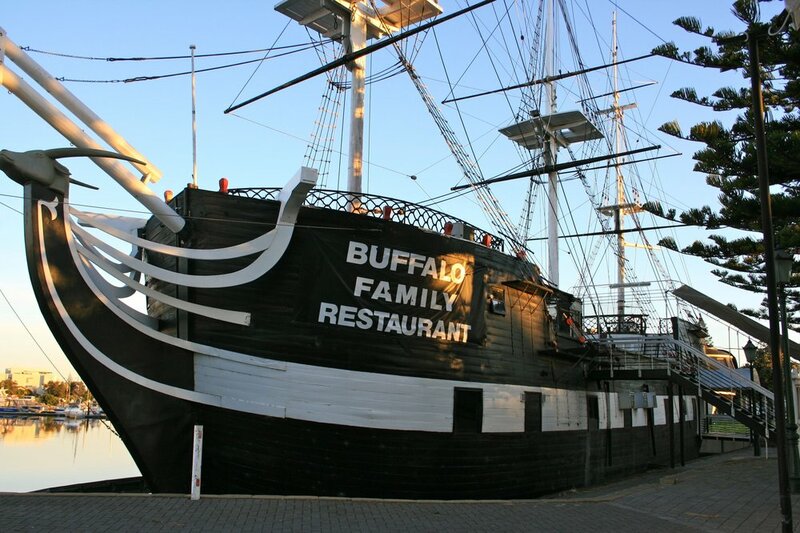 Restaurant patrons were on board an exact replica of the HMS BUFFALO, which finally sank on rocks off New Zealand on a later voyage. The only deviation from the original ship was the ceiling height, which was raised two feet for the comfort of everyone onboard. In our ship’s museum you were also able find a list of names of the original passengers and crew. It became something of a tourist site in some ways and occasionally people who were interested in genealogy would find their ancestors names whom were on that first voyage! You can see from this photo of the finished ship that it looked quite striking and an honest replica of the original. The HMS Buffalo was ‘moored’ in the Patawolonga at Glenelg. 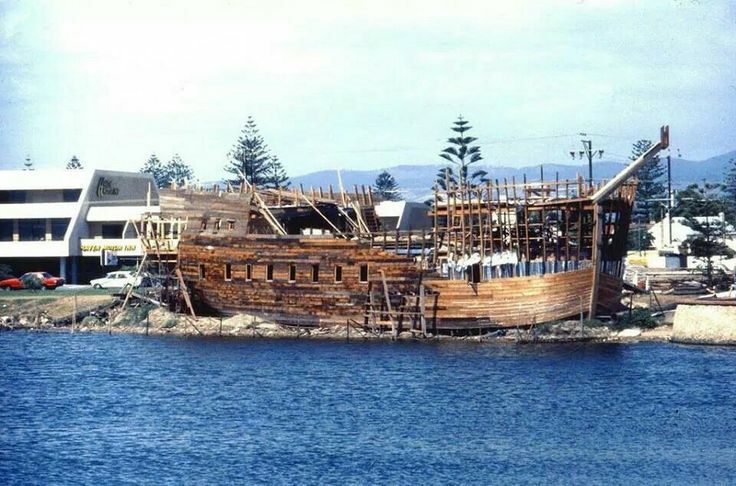 As mentioned above it was an exact replica of the vessel that brought the first free settlers to South Australia in 1836. Located in this iconic landmark was not one restaurant but two, The Family Restaurant and the Captain’s Cabin A La Carte Restaurant. As a nice twist to the experience all passengers were cordially invited by the Captain to enjoy their Nautical Experience by touring the vessel after dining. This is a selection of thoughts from people who ate at the restaurant. We came here for my son’s friend birthday party and needless to say it was delightful. The kids menu was fairly alright but the kids had a ball touring this replica 1836 vessel. There are murals and pirate props for the kids to amuse themselves and pretend they are Jack Sparrow for an hour or so along the creaking decks, or take over the cannons. The Museum is worth a visit, merely to take in the history and have the kids learn a thing or two about this legendary vessel. 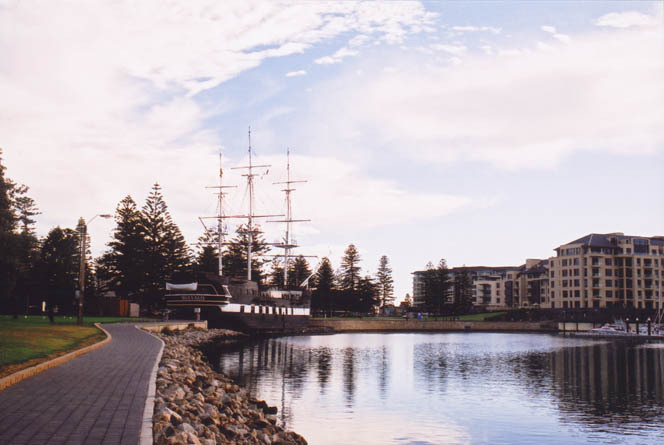 – Kamini N.
On the corner of Adelphi Terrace and Anzac Highway at Glenelg’s Wigley Reserve sits the Buffalo Restaurant aboard a replica of the HMS Buffalo. 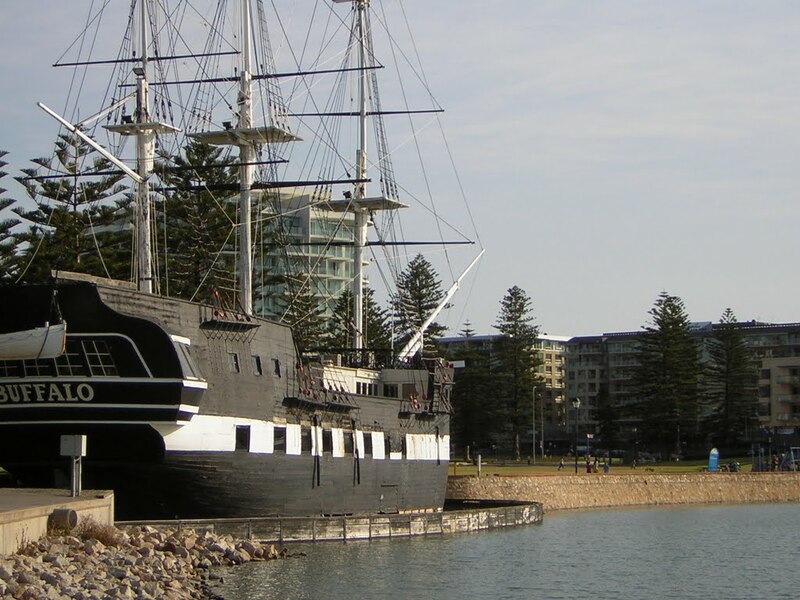 The Buffalo was the first ship to arrive at Glenelg in 1836 to establish the free colony of South Australia. 176 settlers were on board including then Captain John Hindmarsh was later became the first Governor of South Australia. The Buffalo Restaurant as you would expect is essentially a seafood restaurant serving lunch and dinner between Tuesday and Saturday. There is a different menu for lunch and dinner and these days they offer a take-away menu. Most of the food is in the style of pub style and lunches are under $20, dinner mains are mostly $20 – $25. They also offer a kids menu and will cater for kids parties. 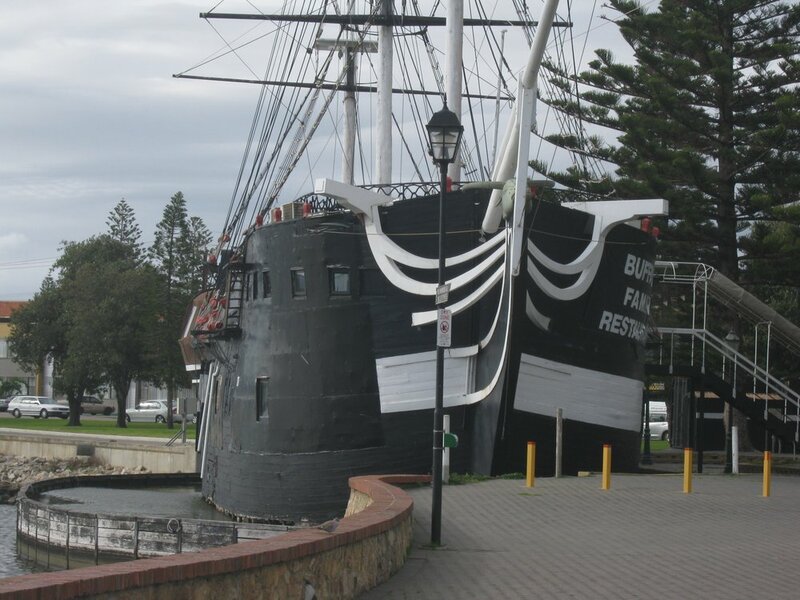 You’re in an old ship (well a replica), the HMAS Buffalo which arrived at the height of the colonisation of Australia. It’s a fascinating museum as well as a surf and turf restaurant. Look over relics from another era whilst dining on rustic fish and chips.